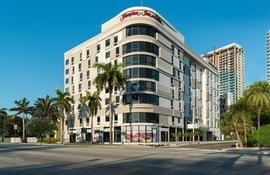 BuyReservations.com is committed to providing the best cruiseport hotel options for MIA. Our airport hotels, which include parking, and cruiseport shuttle transfers, are a great alternative to cruiseport parking*. We strive to get the most affordable rates at the most reliable hotels. Our Park Snooze and Cruise package will make your travel experience seamless and convenient at Port of Miami. *Unless otherwise noted, see Park Snooze and Cruise Package Information. Transfer Notice: Transfer service is available through a 3rd party to the Port of Miami at 10am and 11:30am for approximately $15 per person. Sign up for the 3rd party transfer service at check in. The hotel does not provide transfer service from the pier to the hotel or from the pier to the airport. For the return to the hotel or airport we recommend a ride-share or cab service. Transfer Notice: Transfer service is available through a 3rd party service to the Port of Miami for approximately $10 per person at 9:30am and 12pm(payable to hotel). Sign up for transfer at check in. Transfer service from the cruise port to the hotel or from the cruise port to the airport is available for approximately $12 per person and must be arranged thru the 3rd party service at the time of cruise departure transfer. Fee is payable to the 3rd party service. Transfer service is available through a 3rd party service to the Port of Miami for approximately $10 per person at 9:30am and 12:00pm (payable to hotel). Sign up for transfer at check in. Transfer service from the cruise port to the hotel or from the cruise port to the airport is available for approximately $12 per person and must be arranged through the 3rd party service at the time of cruise departure transfer. Fee is payable to the 3rd party service. Transfer Notice: Hotel provides transfer service to the port for approx $10.00 per person. Hotel does not provide transfer service from the pier to the hotel or from the pier to the airport. Transfer Notice: Transfer service is available through a 3rd party to and from the Port of Miami for approximately $12 per person, each way. Times vary. Sign up for transfer service at check in. Transfer Notice: Transfer service is available through a 3rd party to the Port of Miami at 11am, 12pm and 1pm for approximately $12 per person. Sign up for transfer at check in. Hotel does not provide transfer service from the pier to the hotel or from the pier to the airport. Transfer Notice: Transfers to the pier are included for two people per room. Additional people per room are approximately $10.00 per person. Hotel does not provide transfer service from the pier to the hotel or from the pier to the airport. Transfer Notice: Transfer service to the airport runs approximately every 30 minutes from 7am-midnight and hourly from midnight to 7am. Transfer Notice: Cruise transfers are included for up to 2 people per room. 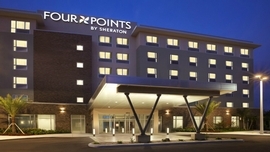 Additional people are approximately $10.00 per person paid to hotel at check in. Transfer Notice: A third party service will transfer clients from the airport to the hotel for $10 per person. Transfer service is not available from the hotel to the airport. Transfer Notice: Transfers to the pier are included for up to two people per room. Additional persons are approximately $10.00 per person. Hotel does not provide transfer service from the pier to the hotel or from the pier to the airport. 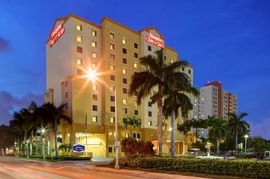 Great hotel option for those flying into Miami Airport and cruising out of The Port of Miami. Hotel includes free cruise port transfers for up to 2 people to the port. Parking is a valet service at an additional cost per day, payable to the hotel. Our Park Snooze and Cruise Packages are an excellent way to make cruiseport parking convenient and affordable. 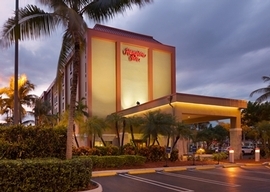 If you have a late cruise docking at Miami International Airport, staying the night of your return is also an option. You can take advantage of parking your car at the hotel prior to your cruise and getting well rested at the hotel the night of your return. Our hotels allow for late arrival check-in so you know your room will be ready even if you have a late cruise docking.